Is this turned into the flax that we eat? Even if it’s not, the flower is a beautiful yellow. Flowers like daffodils are such a pretty shade of yellow. The plants are related. Cultivated flax is Linum usitatissimum — it’s the Linum in both scientific names that shows they’re related. Cultivated flax has so many uses. Linen is made from its fiber, flaxseed oil and flaxseed are often part of our diets, and even my hair setting gel has flaxseed in it. As far as I know, this flower is best-known for being pretty — and for being occasionally toxic to grazing animals. It’s not one to add to your salad. Its yellow often is tinged with orange, and it has a pretty reddish-orange center. The root of Latin linum has given us not only linen but also lint, lingerie, and even line. Lint and lingerie make sense, but line surprised me. When I was off on a little side road, exploring how linen is made, I bumped into fabric made from another fiber: pineapple. I remembered your mention of it from the wedding, and read more about it. It seems to be quite popular, as well as being attractive. Several of the online sources had notes that it was out of stock, or only sporadically available. One thing that makes it harder to reconcile line is the change in meaning that has taken place. While the expression straight line is redundant now, it originally wasn’t, because line meant ‘curve.’ That sense had been abstracted from the curvy nature of a piece of thread, which I guess often happened to be made of linen. As I read the wonderful Rumi stanza, I flashed on that moment in the old Judy Garland film “Wizard of Oz” where, after her harrowing tornado ride, Dorothy steps out of the old Kansas farmhouse and finds herself in Oz. I first saw it as a 6-year-old in the movie theater downtown. Going to see a movie was a very rare treat. I never would have thought of it, but now that you have, I can see the photo as a floral version of the Yellow Brick Road. As a matter of fact, it was taken on one of our wonderful Texas roadsides. It’s not just Indian paintbrush, bluebonnets, and pink evening primrose that show up there; there’s so much variety. It’s that moment of the film, which has been in sepiatone B&W up to that point. Dorothy steps out onto the porch of the house, the camera pans around to her point of view, and TECHNICOLOR HAPPENS! — born into color indeed. Great focus point and background for beautiful glorious yellow blooms. Rumi surely would approve. The blooms are gorgeous, but I was just as interested in those buds; look how many flowers were yet to come. This plant often provides scattered flowers, but it also can be the very definition of “prolific bloomer.” I’m not sure what Rumi would think, but I’m glad you like it. Beautiful, and how lovely to capture the flowers at sunrise. Swap the yellow for blue and you have the flax growing in my garden. I don’t know if we could get them to grow together, but wouldn’t the yellow and blue make a lovely combination? Very Van Gogh-ish, and beautiful in one of your lovely vases. They would be wonderful together. When I drive inland from Christchurch, I sometimes see fields of blue flax. It looks beautiful. Those- the photo and the Rumi verse- are both keepers, Linda. Thank you. You’re welcome. I’m not surprised at all that you’d enjoy a nice patch of color, and those words of Rumi. They apply to the creative process as well as to anything else. “Born into color” is a beautiful image! I imagine people with suddenly-corrected vision feel this way. How sad that so many of us lumber through life not really seeing — or appreciating — the beauty around us. Illinois is on the fringes of the area where flax is native; that said, if I’ve seen it at all, I certainly didn’t know its name. Thanks for educating me once again! I certainly experienced a bit of that after my cataract surgery. I wasn’t seeing colors so well, and afterward, I realized just how dull things had become, without my being aware of it. Maybe that’s what we all need — internal lens replacements, so we can see the world more clearly. One thing is certain. Finding these flowers is one thing. Figuring out what they are is something else. But it’s fun: like solving a mystery. I love the light that you captured!!! Isn’t it strange, how light can vary from situation to situation? Sometimes, it almost seems to have substance. I don’t remember everything being so beautifully golden that day, but the photo certainly hints at it. I suppose the softened focus added to the effect, but I’m still at the point where I sometimes end up with photos I love, without being entirely certain how I did it. So that’s what those are! I have seen them before and never known — couldn’t quite match them up in my book. Wonderful words to share with this beautiful image, Linda. It was Ruth, your friend from Michigan academia, who introduced me to Rumi — years ago, now. It’s quite something, to think of all we’ve learned from one another, in so many ways. I’m so glad you know these. They’re wonderful little flowers. For a couple of years, I saw only scattered plants, and a very few flowers at a time. When I found great swaths of them, I hardly could believe my luck. It was almost as good as a trip to Southern Exposure! The trick is remembering that escaping into is as important as escaping from. It generally takes some time to get a grip on that life lesson. Rumi’s not a bad teacher in that respect. Wonderful shot – – that field of flax looks like it goes on forever. 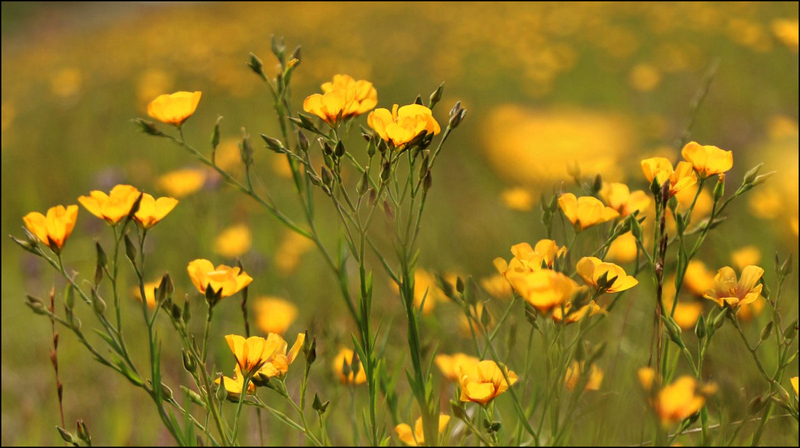 I’ve only ever seen blue flax, which is a great color, but this yellow is beautiful, too. And I like the juxtaposition of the cheery flowers with a verse “taking an axe to the prison wall” – excellent! And I’ve never seen blue flax, which amuses me. I had to look it up, and it’s equally beautiful. In a strange bit of serendipity, your comment helped me solve a years-long mystery. Twice a year, I get a sudden rush of search terms related to the phrase “a mob has many heads, but no brains.” Despite searching, I’ve never been able to pinpoint which of my posts was bringing them here, although I suspected the searches were related to high school class assignments. When I looked at another of my posts where I used the Rumi poem, I got my answer. I quote the English churchman and writer Thomas Fuller, who apparently first used the phrase in the 17th century. Why I never could find my own use of the quotation through Google or a WordPress search, I don’t know, but now that mystery’s solved. And, it was pretty interesting reading that 2009 post about Iran. The WP search engine doesn’t seem to be firing on all cylinders. I’m glad you figured it out. A lovely quote, and that image – just saturated with yellow. Honestly, I think the photo’s one of the best proofs that “liquid sunshine” might actually exist. I’d like to have an extra gallon of that saturated yellow in the closet for days that are just too gloomy and gray for words. The quote is absolutely lovely and fitting. Now that you’ve mentioned it, I agree that the yellow flax on a white background wouldn’t be nearly so pleasing as the blue. One of the things that helps to “make” this image for me is the combination of yellow and green: but I always enjoy yellow and green, so there’s that. Even though I’ve tried to learn to appreciate black and white photography, it’s color that I love. Even my favorite white flowers have green to set them off. Color is such a gift. Yes, color is indeed a gift, and I am thankful that I’m not ‘red-green’ deficient like some in my family…. I am not sure if my strength in the maths made it easy for me to draw well.. or if my abiliy to draw well helped me in the maths! And here we are — back to the chicken and the egg. Which came first doesn’t matter nearly as much as the fact that both showed up! Sometimes an image calls up words, and sometimes words come to mind and I go looking for a photo, but it’s always a delight to find a pair that works. I’m glad you enjoyed this pairing — and isn’t the color wonderful? We may not have daffodils or forsythia, but at least we have spring-yellow here in Texas. These are very yellow brick road scene like. I still haven’t been to Pine Gully, and can’t get my mind around exactly how it’s laid out. When I went to the website and saw that it’s a $10 entrance fee for non-residents — $20 on weekends — I couldn’t believe it. Is that strictly for vehicles? Do you access the place via the trails and park on Todville? It’s all very confusing, and I couldn’t find any other information. I guess I need to just go over there and scout it out, or have you draw me a map with a crayon. Of course, I could just follow the yellow-and-red-petalled road. That probably would do it. OK. You need a backwoods guide. (We don’t go to the ya gotta pay part – but access it from trails down the gully – like everyone else. There’s a new part. Will have to call and set up a rendezvous.